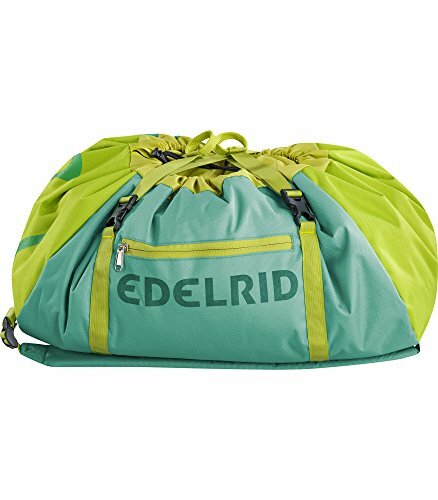 The Drone, a large, robust rope bag with shoulder straps now comes in a new color, Jade. --The History of EDELRID-- EDELRID was founded by Julius EDELmann and Carl RIDder in 1863. At first, the company made braids and cords. Julius Edelmann was a salesman and mountaineer, Carl Ridder a technician, who specialized in braiding machines. The faces might have changed over the years but EDELRID remains an innovative and creative company to this day. In 1953 EDELRID invented the kernmantle rope and revolutionized the world of climbing. Materials and production techniques were constantly improved and then 11 years later, EDELRID produced a rope capable of withstanding multiple falls - the forerunner of the modern dynamic climbing rope. Climbing has never looked back since. EDELRID specializes in four sectors: Sports, Safety, Adventure Parks and Industry. The four EDELRID divisions originate from the company's core competences in textile braiding and processing (i.e. weaving, braiding, stitching and textile finishing). As a manufacturer of Personal Protective Equipment (PPE), EDELRID puts safety and quality first during both development and production. OPTIMAL COMFORT: Includes shoulder straps for comfortable transport and an adjustable carry system. TRUSTWORTHY EXPERIENCE: Our Company has 150 years of rope making and alpine equipment experience at your fingertips. Our years of hard work have rendered products that you can trust on your next climbing adventure.